This is a great weeknight dinner: simple to make and very flavorful. We enjoyed ours with some firm tofu and rice, though it would be great with chicken or pork too. Roasting brussels sprouts under high heat caramelizes the outer leaves, making them more palatable to folks who don’t usually enjoy these miniature cabbages. Sunchokes, also called Jerusalem artichokes, are a relative of the sunflower and have a mild flavor that soaks up the bright ginger and lime in this dish. 1. Preheat oven to 400°. In a mixing bowl, toss brussels sprouts, Sunchokes, garlic, onion, oil, chili powder, coriander, and salt until the vegetables are well coated with oil and spices. Spread on a sheet tray and roast for 20 minutes or until the Sunchokes are easily pierced with a fork- the finished texture should be similar to a roasted potato. 2. Remove vegetables from the oven and place back in a mixing bowl. Add grated ginger, lime zest and juice and carefully toss. 3. 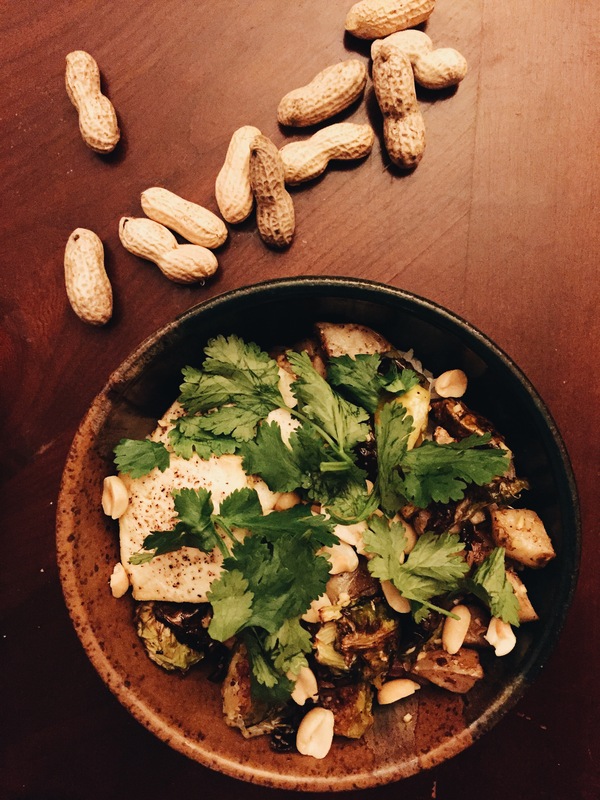 To serve, top brussels sprouts and Sunchokes with crushed peanuts and cilantro. Sunchokes are like the secret agents of the vegetable world. They go by many names (Jerusalem artichokes – though they are not from Jerusalem nor are they artichokes, sunroots, earth apples, and topinambour) and easily blend in with many vegetables thanks to their mild nature. These tubers are a close relative to the sunflower though they visually resemble the ginger root. Sunchokes are a New World food that was cultivated long before Columbus arrived. It makes sense that they were a staple food in the Native American diet, considering they are an excellent source of potassium, iron, and fiber. While they have a similar consistency to potatoes, sunchokes’ flavor is sweeter with a certain “je ne sais quoi.” They are delicious when roasted or made into chips, but for a weeknight meal, I like to enjoy them as a hearty soup with a fresh salad and some crusty bread. In a dutch oven or soup pot, heat olive oil. Lower the heat and add the carrot, celery, and shallot. Sweat until the onions are translucent. Stir in the fennel seeds, sage, and nutmeg. Allow flavors to meld for a minute or so. Add sunchokes, potatoes, and vegetable stock. Bring everything to a low simmer. Continue to cook until sunchokes can easily be pierced with a fork. 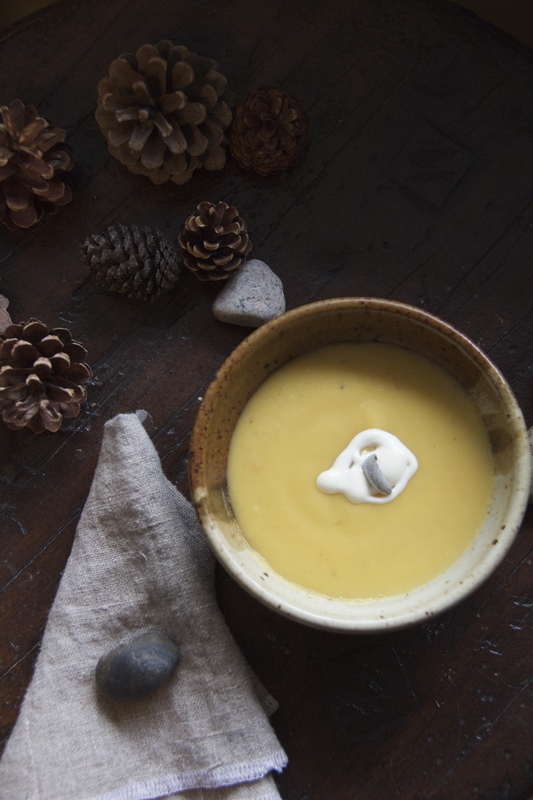 Use an immersion blender to puree the soup (or use a regular blender and work in small batches). When it has been blended, add any water as needed to thin the soup to a desirable consistency. I like mine fairly thick, so I only added about 3/4 cup of water. Spoon into serving bowls (this recipe should serve four for dinner) and garnish with creme fraiche or sour cream.